They say dying is easy and comedy is hard. At Corn, we say both are easy…especially when booze is involved! Back again like the Bird Flu, the original drinking show returns to the Cornservatory stage for the sixth installment of everyone’s favorite hor-omedy sketch show Death Toll – A Drinking Game Performance. 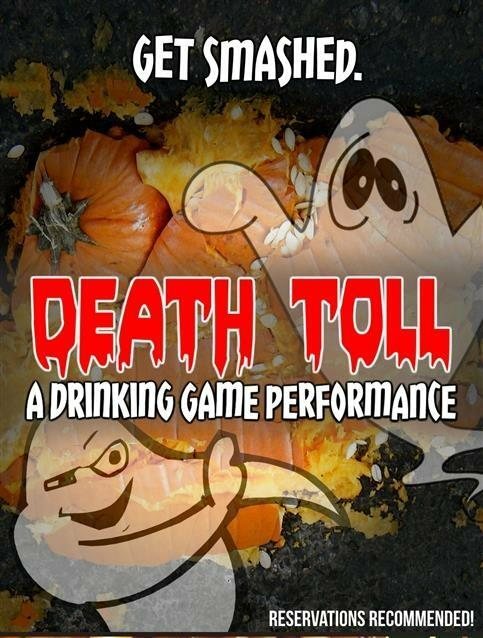 A simple show with a twist…a lemon twist… Death Toll – A Drinking Game Performance offers up hilarious and spooky sketches where people die and the audience drinks every time they do (with the help of our incandescent DRINK sign)! Join us for an hour of scary sketch comedy, written by Corn’s tanked-up team of grim drinkers. Should you forget our one garish drinking rule, our ‘DRINK!’ sign will guide you as the body count rises. And best of all, we’re BYOB!